Portmagee has a number of great festivals and events throughout the year which are run in association with Fáilte Ireland. Portmagee’s Annual Traditional Irish Set Dancing & Music Weekend takes place on the May Bank Holiday weekend. 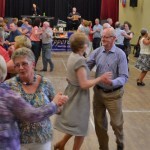 The weekend programme is varied with dancing to live music in the Bridge Bar, a Set Dance Workshop and a ‘Mighty’ Céilí with a top class céilí band. For over a century and a half, the arrival of each new year is celebrated in Portmagee with a unique custom called ‘The Old Year’. It’s a little bit crazy, a little bit amazing but a fantastic experience.